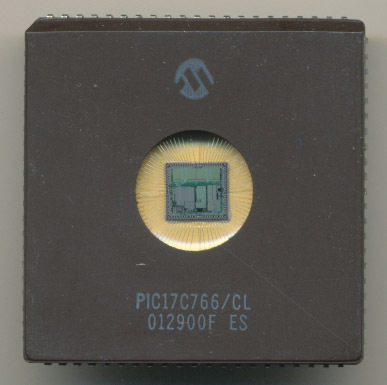 CPU of the Day: The Largest Microchip PIC? If there is anything a Microchip PIC is known for typically ‘large’ is not what comes to mind. PICs were originally developed in the 1970s as a peripheral controller and ended up finding uses in products of every sort, for 35 years and counting. The PIC17 series extended the original 12 bit architecture to 16 bits (16 bit instructions, ALU and registers are still 8-bit). It added many new instructions (58 total) and an 8×8 hardware multiplier. 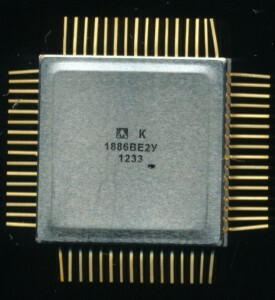 Max clock speed was 33MHz. It was considered the ‘high end’ of the PIC line but now has been replaced by the PIC18 line. 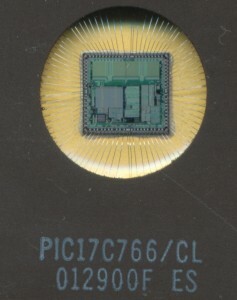 Most of the PIC17s produced were in the 40-68 pin range. Many designers considered the PIC17 to be a less then great processor and in 2000 Microchip replaced it with the much better PIC18 line. This PIC17C766/CL was one of only 7 variants in the line (17C42,43,44, 752,756,762 and 766) compared to the many dozens in the PIC16 or 18 lines. Produced in an 84 pin CLCC with UV EPROM window (for its 16k EPROM) the 17C766 provided 66 I/O lines, more then enough for any project. 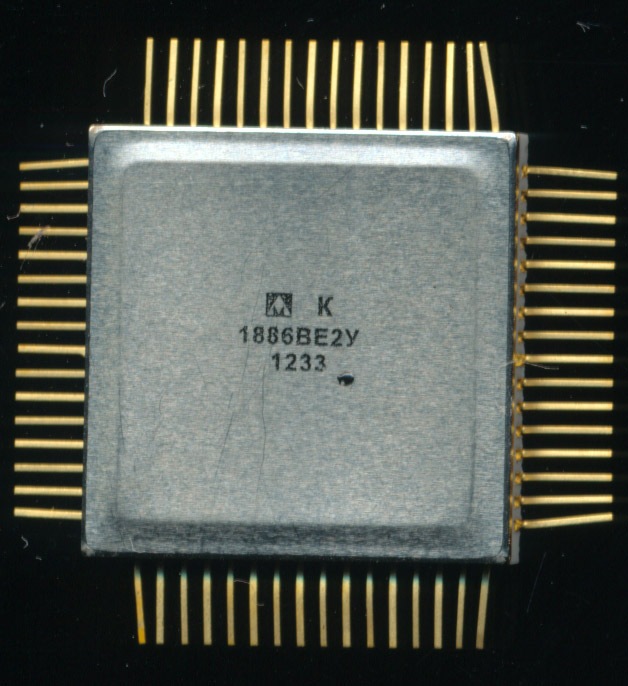 It was used in some PIC development systems and emulators which were some of the few systems that really needed a PIC with 84 pins. This particular example also happens to be an Engineering Sample and was produced in mid-2001, AFTER the introduction of the PIC18, it seems there was still at least some demand and use for the PIC17 a decade after its introduction.